At Pooks Hill Tower and Court, we offer spacious studio, one, and two bedroom apartments for rent in Bethesda, Maryland. Our luxury high-rise and midrise homes with courtyard are recently renovated to bring you even more must-have features and contemporary finishes. With a wide range of floor plans to choose from, you’re sure to find the space that fits you perfectly. 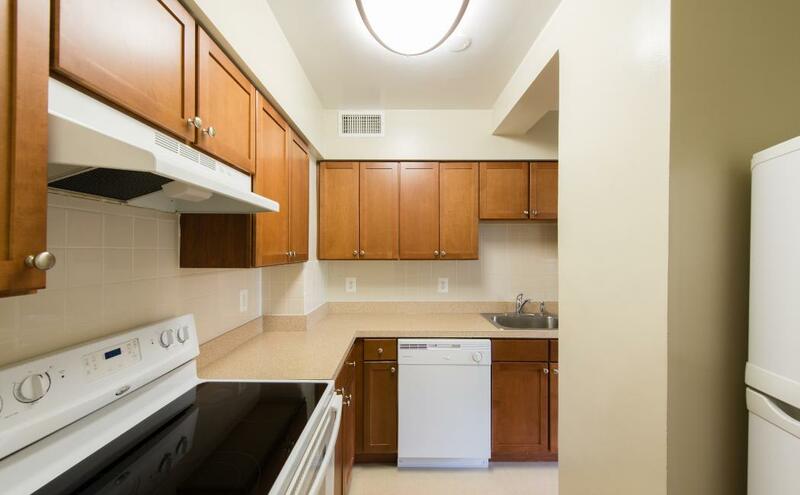 Our comfortable studios and spacious one or two bedroom apartments offer the best in updated apartment living. Your new home has plenty of space, with king size bedrooms in roommate-style layouts, a separate dining area for comfortable meals, and a bonus linen closet. Select homes feature walk-in closets, with some offering additional storage space, if you need it. No matter what size apartment suits you best, you’ll enjoy smart finishes throughout your new home, including stainless-steel appliances, custom cabinetry, and new countertops in your recently remodeled kitchen. A ceramic tile backsplash in the kitchen and ceramic tile surround in the bathroom add a touch of elegance to your space. In select homes, you can experience an extra level of relaxation with a private patio or balcony overlooking our lush and beautiful grounds. Ready to find the perfect space for you? Call us to schedule your personal tour.